Flex, Java, RIAs, Eclipse, and information about the Potomac modular framework for Flex. I'm happy to announce that we've made Potomac live to the public. You can find its new home at www.potomacframework.org. 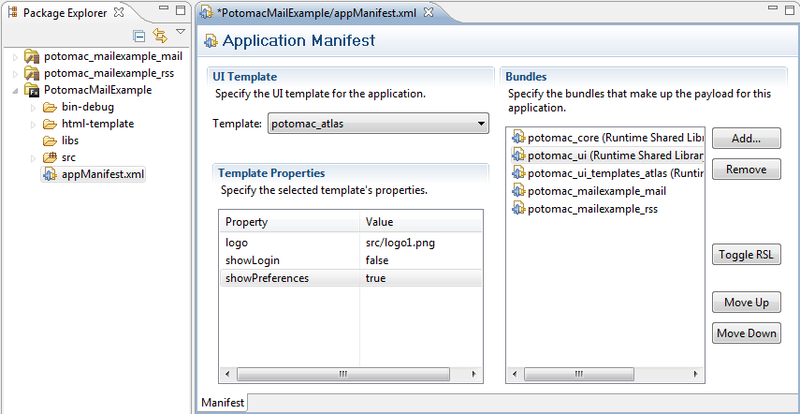 Potomac tries to take the modularity in OSGi and the UI composition from the Eclipse RCP and bring it to Flex. It isn't an easy task - we've had to write a fair bit of tooling on top of FlexBuilder to help accomplish it. One of the most exciting features of Potomac is its metadata support (Flex metadata ~= Java annotation). All extensions and extension points are defined in code via metadata. Its been great to see this feature come together. Contributions to the UI are handled via [Page], [Folder], and [Part] tags but also other features like [Inject] are also based on extension points. After seeing the results, it might have been better to rename the feature to more generic since its become more like a generic metadata processor. You can see more in the Potomac 5 Minute Tour. This is really exciting work. I'll be closely monitoring the project and give it a try asap ! It is really very great. It will be very helpful. © 2009 Chris Gross · Proudly powered by Blogger & Green Park 2 by Cordobo.